The new progress gauge and double donut charts provide you with even more choices for creating data visualizations to help you effectively analyze and interpret data. By choosing visualizations that best meet your needs, you can gain better insight into your data and make better business decisions. To measure the progress of a goal, create a progress gauge chart by using Chart Control. You can include the chart in a harness, section, or flow action form. 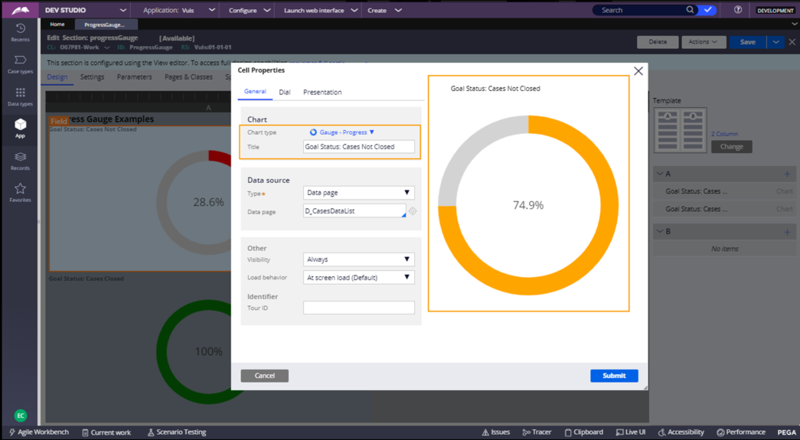 For example, you have a goal to close a certain percentage of cases over a specified period, as defined on a data page. If you need a report that shows the percentage of cases that have not met the goal, you can create a progress gauge chart. The following figure illustrates creating the progress gauge chart. The whole dial represents the entire goal and the colored portions of the dial depict the work that has been completed. If you need an interactive chart that shows a large amount of hierarchical data, use the double donut chart widget. This multilevel pie chart dynamically shows values for components that make up a larger data set. For example, the progress gauge chart in the previous example can keep you up-to-date on the progress of your goal. However, you might find that loans are not being closed fast enough to meet your goal. You can configure a double donut chart that shows both the overall status of the goal and the status of individual loans that are counted toward the goal. The following figure illustrates creating the double donut chart. After you add the chart visualization control as a dashboard widget, you might see that a large number of loans are pending. To see which loans are pending, hover over the Pending region of the chart. The following figure illustrates viewing pending cases. After you review the pending loans, you find that most of the loans are pending because of a lack of documentation. With this insight, you can modify the document processing stage of the loan application process to expedite the closing process and achieve your overall goal. For more information about including charts in reports, see Harness and section forms - Adding a chart. 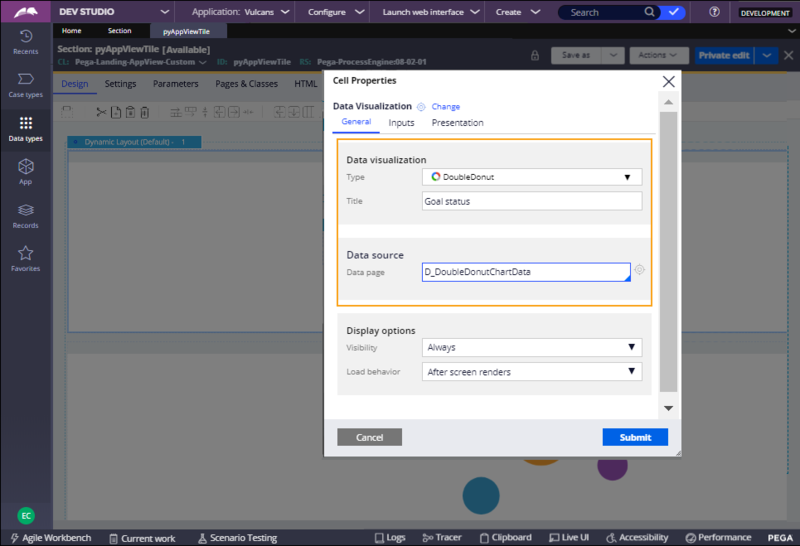 For more information about configuring a data visualization control, see Adding and configuring a Data Visualization control. For more information about adding charts to dashboard widgets, see Adding a widget to your dashboard.